The sandalwood capital, Mysore in India, boldly straddles both the ancient and contemporary. The erstwhile capital of the Kingdom of Mysore before Benguluru took over, this small city has its own share of secret gems. Be it the scrumptious food, the ancient temples, the charm of the Royalty, or its enthralling museums, Mysore has something for everybody who visits. This guide will help you get around and optimize your trip to Mysore. Head out for some lip-smacking traditional breakfast at Mylari at Nazarbad road. There are only three options to choose from, Idli, dosa and filter coffee. Try the melt-in-the-mouth Sagu dosa served with coconut chutney and wash it down with delicious filter coffee. Unlike other masala dosas, which have a potato filling, this dosa comes with a sago-coriander-onion paste. This restaurant is 60 years old and people come from far and wide to have the Sagu dosa. I bet you will not be able to stop at just one! Mysore has a rich cultural heritage and a good way of exploring that would be through the Royal Mysore Walks. The 2-3 kms walk enlightens one on how various important world events are connected to Mysore, and little known aspects of Mysore's history that includes the Tamil Nadu CM, Jayalalitha's grandmother being the first woman graduate in Mysore, and how upon losing a war, the British took Tipu Sultan's young sons , aged 9 and 7 as war hostages!! You can view vintage photos from Mysore's past to compare the past with the present. 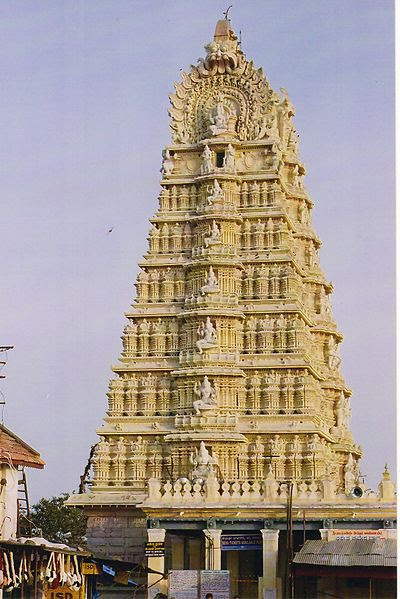 Visit the Chamundeshwari temple which is about 13 kms from the city of Mysore., The presiding deity, ‘Chamundi’ or ‘Durga’ is the fierce form of ‘Shakti’ and is also the presiding deity of Mysore. The temple is believed to be over a 1000 years old and built by the Hoysala rulers, while subsequent extensions were built in the 17th century by the Vijayanagar rulers. There is a flight of 1000 steps leading up to the hill summit and there is a statue of a 15 feet tall and 24 feet wide Nandi (bull) on the 800th step. Free food is served in the temple everyday between 12.30-2.30 pm. Mysore has some lovely eateries which offer traditional Mysore food and one of them is Dasaprakash at Gandhi square. Even the late Wodeyar Maharaja is said to have visited this restaurant sometimes. The thali comprises chapatis, rice, rasam, two types of curries and masala rice. End your meal with the delicious kheer/payasam which is made with rice, coconut milk and jaggery. Another dessert which is a must-have is the melt-in-the-mouth halbai, which is halva made of rice flour, cocout milk and jaggery. Head to Hotel Siddhartha in Nazarbad for sumptuous dinner. Their set dosa is spongy and comes with coconut chutney, coriander chutney and sambar. Their bisibelle bhath is rightly spiced and bursting with flavours too. Wash it down with a steaming cup of filter coffee. 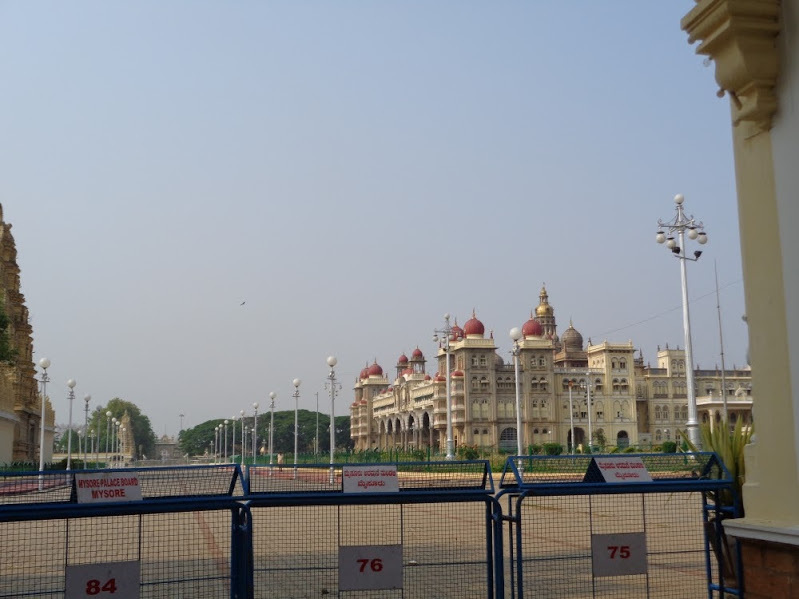 Head to the famed Mysore palace and be charmed by the Royalty. Stroll leisurely in the sprawling palace which is a three storied structure and was designed by an English Architect, Henry Irwin. You’ll get to see sculpted pillars, a golden throne embedded with jewels, paintings and shrines. Photography is prohibited inside the palace premises. The palace is illuminated on Sundays, Public Holidays as well as during the Dasara Celebrations with 97,000 electric bulbs. If you an art aficionado, a visit to the Art gallery will be worth your time. 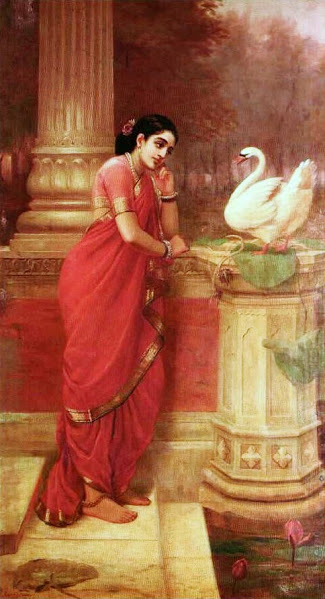 On display are original paintings of the legendary painter Raja Ravi Varma. Did you know he was the first artist to give a popular face to Indian Gods and Goddesses through his paintings? Prior to that people worshipped statues, sculptures and miniature paintings. And he also designed the sari as we know it today and the way women almost throughout the country drape the sari today is fashioned on how he draped the Goddesses and women in his paintings. The museum also displays possessions and souvenirs of the Mysore royal family such as rare musical instruments Japanese art, and other memorabilia. The market has around 700 stalls in different lanes dedicated to different items like fruit, vegetables, flowers, etc. Nothing gives you a taste of the pulse of a place than its old markets abuzz with people, flies, aromas, colors and textures. In the lane dedicated to different varieties of bananas, try the, Nanjangud Rasabale which has an interesting hybrid taste of a banana and mango. In the corner facing the main road you’ll see Guru Sweet Mart. Ever wondered the origins of the famed Mysore pak? This is your answer. This shop was started by Kakasura Madappa, the royal chef, who made the Mysore pak for the then king in the early 1900’s. The fifth generation of the inventor of the Mysore pak still runs this shop. For a place which has such a legend attached to it the shop is ridiculously small, just 5 x 5 feet. For a quick refreshment head to the Brahmin Soda Factory on Old Bank road for ice creams or fruit salads. It’s a small place which gets cramped with people seated facing each other like in a train coach. They have different flavours of ice creams and sodas. Try the refreshing Sarasaparilla juice which is an extract of the roots of a plant by the same name and is believed to have health benefits. Head out for the light and sound show at the Mysore Palace which happens everyday except Sundays and public holidays from 7-7.45 pm. The show narrates the history of Mysore Kingdom, the rule of Wodeyars, etc through the combinations of sound and light. No trip is complete without shopping. The State government runs many branches of the Cauvery Handicrafts Emporium, to promote Mysore handicraft and local specialties. You’ll be spoilt for choice to take home gifts and souvenirs. Take a pick from different items made and craved on sandalwood, Mysore saris, and sandal scented soaps and incense sticks.